The 5-AMP-activated protein kinase (AMPK) is a key sensor of intracellular energy balance. AMPK is activated in response to an increase in the AMP/ATP ratio which can be caused by a number of factors such as muscle contraction, starvation, or hypoxia. AMPK is a heterotrimeric protein complex comprising of α- (63 kDa), β- (38 kDa) and γ- (38 kDa) subunits. For each subunit, isoforms have been identified (α1, α2, β1, β2, γ1, γ2, γ3) which theoretically allow the formation of 12 different proteins. The α-subunit contains a serine/threonine kinase domain and the regulatory subunits contain binding sites for AMP and ATP (γ-subunit) and for glycogen (β-subunit). AMPK is activated by phosphorylation on Thr-172 within the catalytic domain. AMP binding results in a 2 to 5-fold increase in AMPK activity compared to the basal level. Binding of AMP to the γ-subunit causes allosteric activation of the kinase and induces a conformational change in the kinase domain that protects AMPK from dephosphorylation of Thr-172. BioAssay Systems’ cell-based ELISA measures phosphorylated AMPK in whole cells and normalizes the signal to the total protein content. The antibody recognizes both α-subunits and, thus, can be used for cells from all tissues (human, mouse, rat). This simple and efficient assay eliminates the need for cell lysate preparation and can be used to study AMPK regulation in short-term and long-term assays. In this assay, cells grown in 96-well plates are fixed and permeabilized in the wells. AMPK phosphorylation (pAMPK) is measured using a fluorescent ELISA followed by total protein measurement in each well. 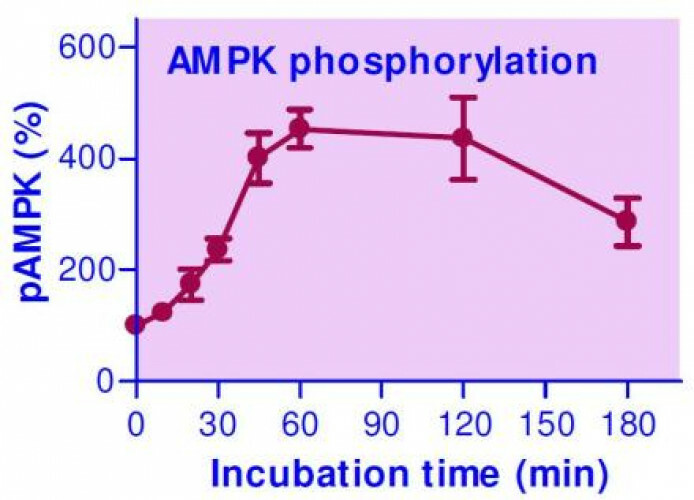 Applications For quantitative fluorescent immunoenzymatic assay of AMPK phosphorylation status in cultured cells.